• As the body count rises, no one expected the biggest casualty of them all: Friendship. Will these Avengers betray their closest confidants to stay true to themselves? • Featuring Nick Fury, Colleen Wing and Alpha Flight! Five doesn’t have much going for it but Four has Power Pack, that’s pretty cool. Magik isn’t on the cover to this issue, so that’s disappointing but I’m sure she’s still in this issue. • No time for second-guessing, Captain Marvel is determined to change the future to protect the present. • With wins on her side, Carol knows her mission is the right thing to do, but does everyone else? 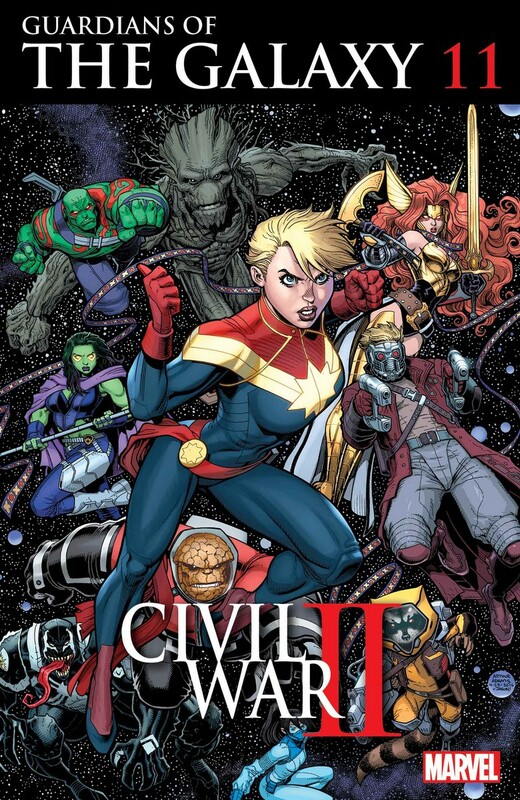 • Sensational writing team Ruth and Chris Gage (Marvel’s Daredevil on Netflix) bring you a Civil War II story that will change everything for Captain Marvel. I like how the solicits are being coy and smart about not hinting at what is really going on but providing an illusion of information. I’ve decided I’m on Team Carol but I could be swayed if Kitty is on Team Tony but I can’t imagine she would be – just based on characters. That’s another fun element, we know what the sides are but not who Is leading which side. At least, I don’t know but I’m not really following this event’s press releases. • A top secret mission on behalf of an old friend, a tropical cruise. What could go wrong? Turns out it’s a theme cruise – super-hero themed, naturally – a floating comic con. Now Bobbi is trapped on a boat with a thousand cosplayers, caped colleagues she was trying to avoid, an ex-boyfriend who keeps showing up at inopportune times and a rampaging herd of corgis. I wonder if the cosplayers in the issue will all be Mockingbird related or will there be other heroes? I know Marvel Database didn’t list costumes for that one Wolverine and the X-Men issue, Issue nine of volume two. Look how gorgeous Art Adam’s cover is there! He needs to do a Guardians title, I wish Pryde had a bigger spot in it but she’s on Team Carol, so that feels right. I can only imagine that Magik is also on Team Carol, along with the bulk of the X-Men. Those Tsum Tsums are pretty cute, I want to get my wife the Little Mermaid ones and I want to get the Dumbo ones for me. • CAPTAIN MARVEL has called for backup, and ROCKET and GROOT are here to turn the tide! • But as CIVIL WAR pits PARTNER against PARTNER, can Rocket and Groot’s friendship survive a TRENCHANT DISCUSSION OF THE ISSUES AT HAND?!?! • Probably! But can THEY survive a confrontation with GWENPOOL?!?! Shame that the Guardians story isn’t just spreading out to the other titles under the umbrella but that is nicer on the ol’ wallet. Gwenpool is starting to appear in other titles, so that’s interesting. Looks like the Guardians are on Earth for Civil War II so they could appear in several titles, or backgrounds of titles. I do like Flash and Peter having a lively discussion. • How did Ulysses join the Inhumans? • What difficult journey did he have to go through to master his powers? This does seem like it should be an important to the event, as Ulysses is the Inhuman in the center of the entire event. I’m not sure who Al Ewing is but it makes me think that is isn’t going to be as pivotal as I would think it is. I feel like this series should have been $2.99, right? I’ll track this to see if Kitty, Lockheed or Magik appear in it. Lockheed would be so gosh darn cute in it! Four issues does seem to be a bit much but ideally, the trade should be under ten dollars, right? Probably not as the series itself will cost sixteen, monthly. They can’t make Tony’s parents already established characters, can they? I thought it was dumb to even make Tony be adoptive but I get that when one runs out of times, a writer has to go back to the character’s origins and tweak it. I understand that Bendis didn’t introduce this element but he could have done what the next writer will do and just ignore this development. A female Electro, could this be Electra? Or would that be to on the nose? • A COUNCIL OF DRAGONS comes looking for a newly hatched baby dragon. BABY! DRAGON! • But scarier than DRAGONS is KILLER THRILL — loose on Drax’s ship and looking for the hatchling! • Luckily, some powerful FRIENDS are stopping by as backup! Dragons? And powerful friends are stopping by? Could this be Lockheed’s first appearance in the All New All Different Marvel? That would be truly great. • The person behind all of Howard’s troubles is revealed! Who could it be? Is it Spider-Man? Wolverine? Thor? Ms. Marvel? Am I just mentioning these characters on the off chance that some retailers will just skim the catalogue looking for character names and will accidentally order this? Grimm and Rocket are on the cover, could Kitty be within the pages? “Last Days of Magic” aftermath! • How did Stephen Strange become the Sorcerer Supreme? • And how has he lost it all? Wait, has this all been leading up to a retelling of Strange’s origins? Magik has been active in the beginning of this arc so I’m hoping that she keeps appearing in it. • This special one-off issue promises two amazing things: SUPER HEROICS and COMPUTER SCIENCE. • Yes! By the end of this issue, you will know both how Squirrel Girl can take down COUNT NEFARIA and also a few really fundamental concepts in computer science! • Have we found a way to express CS concepts through the medium of super hero fights? YOU’LL HAVE TO ORDER THE ISSUE TO FIND OUT! • But yeah, we totally did. • Featuring all the greatest Squirrel Girl tropes you love! Including fights, jokes and COLD, HARD LOGIC. Count Nefaria? That’s going to be pretty awesome when they talk about this on the Uncanny X-Cast! • Sam Alexander’s finding it hard to cope with the fact that his dad is M.I.A. in the far reaches of space. Luckily, this Father’s Day, Nova’s got the chance to help former New Warrior Midnight’s Fire put his family back together. But when Iron Man shows up to inform his young teammate he’s backing the wrong horse, will Nova cool his jets? secret storage locker. Who sent them? What do they want? Bucky doesn’t care — he just wants his #$%& back. These have looked amazing, in the store but I haven’t had a reason to really read one yet. • One is a time-displaced cosmically powered angel from the ‘60s. • The other is a homicidal clone struggling to fulfill her dead father’s legacy. • But who says Angel and Wolverine can’t make their relationship work? I do like Angel and X23 together. • …and little does Magik suspect that the X-Men’s newest charge is drawing it straight to X-Haven! • Meanwhile, Colossus is rampaging across Earth…as a Horseman of Apocalypse. Can Nightcrawler and Iceman stop their longtime friend and teammate and wrest him from Apocalypse’s grasp? So is Apocalypse Wars over? Did they leave Colossus as a Horseman as an afterthought? I like Magik taking mostly center stage in this title. • The X-Men are working security at LILAPALOOZA – Westchester’s biggest festival! • But just because they’re security, doesn’t mean they stop being TARGETS! • Guest-starring: THE FLAMING LIPS, TOADIES AND LILA CHENEY! Lila Cheney totally deserves to have her own palooza! So this is suppose to be the final issue of Darth Vader, is that right? I suspect he survives this ordeal and probably end up meeting a young man and just getting to know him. Proof that we’re living in the best of all possible worlds: Marvel is publishing a Squirrel Girl graphic novel! It’s a standalone adventure that’s great for both old fans and new readers! It’s a story so huge it demanded an original graphic novel! It’s a story so nuts it incorporates both senses of that word (insanity and squirrel food)! And it’s the best! Squirrel Girl kicks butts, eats nuts, talks to squirrels and also punches really well. She has defeated Thanos, Galactus and Doctor Doom (twice!). But now she’ll encounter her most dangerous, most powerful, most unbeatable enemy yet: herself! Specifically, an evil duplicate made possible through mad science (both computer and regular) as well as some bad decisions. In other words, Squirrel Girl beats up the Marvel Universe! YES! This does sound like a lot of fun. Brian Michael Bendis concludes his Uncanny X-Men era! After relentless persecution and a near-fatal attack, Cyclops and his revolutionaries are targeting S.H.I.E.L.D.! But is the spy organization really responsible for the return of the mutant-killing Sentinels? Sins and secrets will be revealed as warring X-Men gather to hear the reading of Charles Xavier’s last will and testament — but its contents may lead to the team’s ultimate undoing! With the end fast approaching, Scott Summers finds himself driven ever closer to the precipice of disaster. Will Cyclops save himself from ruin or leap off the edge? Plus: Life-changing events rock Dazzler, Iceman, the young mutant Eva Bell and more! Collecting UNCANNY X-MEN (2013) #19-35, #600 and ANNUAL #1; and ALL-NEW X-MEN ANNUAL #1. Bendis’ run doesn’t end on the highest notes but that Kitty and Illyana done-in-one was simply amazing! $50 is too much. Births, deaths and marriages — they’re all here in Gerry Duggan and Brian Posehn’s hilarious take on the Merc with a Mouth. But mainly deaths — and in the case of a zombified horde of U.S. presidents, undeaths! Meet the daughter Wade Wilson never knew he had, the voice in his head he never wanted and the monstrous Mrs. he should never cross — the succubus queen Shiklah! Enjoy Deadpool’s newfound bromance with Wolverine and Captain America before it ends in tragedy, and head deep inside the darkest recesses of his mind to learn his Original Sin. With uproarious flashback tales revealing Wade’s hidden history across the Marvel Universe, Posehn and Duggan work their magic on Deadpool’s past and present — but will they leave him any future? Collecting DEADPOOL (2012) #1-45, DEADPOOL: DRACULA’S GAUNTLET #1-7 and DEATH OF WOLVERINE: DEADPOOL & CAPTAIN AMERICA #1. Does this really collect their entire run? 45 issues alone is well worth $100 and some of these were so very grand! Because Hugh demanded it! Who’s Hugh? The guy who loves side-splitting super-hero satire as only Marvel can deliver it! Prepare for hilarity in the ultimate parody of 2015’s epic SECRET WARS — starring D-Man, Jessica Jones: Herald of Galactus and…Jonathan Hickman?! Plus: more sideways looks at CIVIL WAR, FEAR ITSELF, Marvel NOW! and more funny-book funnies. And Forbush Man returns as creators pose the greatest “What If?”s ever asked. Not a hoax! Not an imaginary trade paperback! (Though it probably should be.) Who says this isn’t the Mighty Marvel Age of Mocking Ourselves? Collecting SECRET WARS, TOO; WHA…HUH? ; ULTIMATE CIVIL WAR: SPIDER-HAM; CAPTAIN AMERICA: WHO WON’T WIELD THE SHIELD; SHAME ITSELF; and MARVEL NOW WHAT?! — plus material from WORLD WAR HULK: FRONT LINE #2-5, ORIGINAL SINS #5 and MARVEL 75TH ANNIVERSARY CELEBRATION. This is such a fun collection of stories! The Marvel Universe is no more! The interdimensional Incursions have eliminated each and every alternate universe one by one. And now — despite the best efforts of scientists, sages and superhumans — the Marvel Universe and Ultimate Universe have collided…and been destroyed! All that exists in the vast empty cosmos is a single, titanic patchwork planet made of the fragmented remains of hundreds of devastated dimensions: Battleworld! And the survivors of this multiversal catastrophe all bend their knee to Battleworld’s master: Doctor Doom! What strange creatures inhabit this world? Which familiar faces will return? And what happens when Battleworld’s domains go to war? The Marvel Universe is dead — and the victors of the Secret Wars will determine what comes next! Collecting SECRET WARS (2015) #1-9 and material from FREE COMIC BOOK DAY 2015 (SECRET WARS) #0. I’ll be curious how well this sells as it is completely missable. I liked the first issue but the rest didn’t do much for me. Bailey Hoskins has just discovered he’s a mutant. For someone who’s never been special, never stood out, this could be his big moment. But as he gains entry into the halls of Xavier’s School for Gifted Children, what, exactly, is his gift? He’s used to being hated, but is he anything to be feared? Bailey struggles to find a place alongside his fellow students, but the X-universe is a big one — perhaps Mystique will see his potential. Could Magneto have just the mission for him? Or maybe the magic of time travel will reveal days of future glory. (Don’t get your hopes up). Max Bemis, frontman of the band Say Anything, makes his Marvel debut with the story of a misfit among misfits, just trying to fit in. Bailey Hoskins? Worst. X-Man. Ever. Collecting X-MEN: WORST X-MAN EVER #1-5. I need someone to tell me if Kitty or Magik appear in issues two through five as Marvel Database isn’t updating those issues and comicbookdb just repeats the cast from the first issue for the rest of the series. The greatest non-team in comics gets the Epic treatment! J.M. DeMatteis and Don Perlin take Doctor Strange, the Hulk, Nighthawk, Hellcat and the Son of Satan on wild adventures into the occult — and against each other! These weird tales begin with a broken Eternity; evolve to include demons, Dracula and the Devil-Slayer; and culminate in a double-sized issue #100 extravaganza! If the Defenders can’t prevail, it’ll be hell on Earth — literally! Known as “The Six-Fingered Hand Saga,” this is one of the most compelling Defenders adventures of all time. Plus: Captain America teams up with the non-team in hopes of staving off the beginning of World War III. And witness the shocking death of a Defender! Collecting DEFENDERS (1972) #92-109, MARVEL TEAM-UP (1972) #101 and CAPTAIN AMERICA (1968) #268. I’ve never heard of the Six-Fingered Hand Saga but JM DeMatteis writing this proves that it is worthy of reading. This is such a great collection of stories! The thrilling saga that commemorated the X-Men’s 30th anniversary! As Magneto’s Acolytes amp up their attacks on Homo sapiens everywhere, the X-teams join forces to put an end to the villainous zealots’ mad crusade against humanity once and for all. But has their leader, messianic madman Magneto, returned from the dead? And as a mysterious disease begins creeping through the mutant community, claiming the lives of hated foe and dear friend alike, which X-Man will buckle under the strain? Matters come to a head in the most shocking way possible, culminating in a devastating attack on Wolverine — and a showdown between Professor X and Magneto that must be seen to be believed! Collecting UNCANNY X-MEN (1981) #298-300, #303-304 and #315; X-FACTOR (1986) #92; X-FORCE (1991) #25; X-MEN UNLIMITED (1993) #2; X-MEN (1991) #25; WOLVERINE (1988) #75; and EXCALIBUR (1988) #71. The X-Men, the New Mutants and X-Factor are targeted for X-Tinction! To rescue a friend, the X-Men must invade the mutant-enslaving island nation of Genosha — but the Genoshans’ memories are long, and their revenge will be terrifying! As the Magistrates strike, X-Factor and the New Mutants are drawn into the conflict — and soon discover old foe Cameron Hodge powered up and pulling the strings! The three X-teams are kidnapped, brainwashed, stripped of their powers, forced into combat — and at least one among them will die! Old friends return, minds are controlled, and mutants are transformed. Can the powerless X-Men triumph over the military might of an entire nation? And when the dust settles on this classic crossover, will the X-universe be changed forever? Collecting UNCANNY X-MEN (1981) #235-238 and #270-272, NEW MUTANTS (1983) #95-97 and X-FACTOR (1986) #60-62. I do like these famous X-Men sagas being kept in print, that’s a good call. So I’m getting four titles at $16 with four dollars off makes my total $12 for the month. That makes me feel safe that I can at least plan on getting five other titles without it breaking my budget. Probably silly and I won’t be buying the series for sure but I have to add Tsum Tsum to my pull list. I will also have to check all of these variant covers to make sure none of my favorites are on any of them.